Deabei is also on . HD: OFA Good - FCI"A"
ED: OFA Normal - FCI"A"
HD: OFA Fair - FCI"B"
- brain attack, "put to sleep"
Killi lived in Hungary, he was great male, excellent stud male, one the best offsprings of our Anee Oridix. Scotty lived in Bulgaria with his brother Spot like family dog. He had great life full of walking and love from his owners. Hooper Deabei/Monika Votýpková - IPO3 (91/84/75) -qualified for VS ČKS IPO 2019!!! We update page D3 litter -all puppies are reserved. Updated page C3 - all puppies are reserved. - Darwin and Destinyare still avalaible. Charon Deabei/Michaela Rubášová - 78th place(96/83/78) - 257p/from 155 world teams! 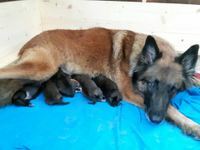 Oliva and Nayko has puppies - 5 males + 4 female, unfortunately last 2 females came after 6 hours and they were death yet. So we have 5 boys + 2 girls štěňátka. Volt Deabei - distance 3rd place -11,4 metres, time 4th place -5,43sec!!! Mondioring2 - Chanuka Deabei/Robert Šašek - 3rd place/10teams (258p)!!! Xai has puppies - 8 males!!!! All are very big, darker and healthy. Charon Deabei + Michaela Rubášová - 5th place (94/94/93a) - CACT, quali for WCH IPO FCI 2018!!!! Ulinka is my true love, female with "big heart", who has the tracking from Good, protection from Good (and Plechacek:), obedience from me and for me...She did great work in place, similar like on training and she showed me how great nose and heart has on tracking (she had very difficult part there and she was amazing there!). Thank you Ulu! Karamel Deabei - E1, CACS, CACIB, BOB (working class) , she executed titl Intechampion C.I.B. Ruby Deabei - PRA+cataract. neg. - 7th place/13 teams (91/75/77a) - 243p!!! !